Taking pictures of stars at night can be done provided you have the right equipment. Digital and film cameras are both capable of taking pictures of stars at night. For film cameras, the camera body is less important than the film itself. You will need high ISO film. This allows more light to be captured in a shorter exposure. HIgh ISO film also reduces the amount of motion blur caused by the movement of the stars. Digital cameras for nighttime photography should allow the user to change the ISO and shutter speed in the controls. All starry skyscapes are not created equal. 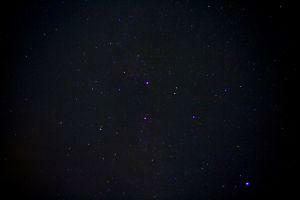 For a crisp, clear image of the stars, a location away from light pollution and outside light sources is needed. The more ambient light surrounding the camera, the longer your exposure will need to be to capture stars. Make sure the location features a flat surface for your tripod to rest on with no interference. The camera lens determines the field of view, or how much of the sky shows. The lens also determines how wide the aperture can be set, allowing more or less light in depending upon the size of the shutter opening. For close shots of a single star or celestial body, a lens with a long focal length will suit the image better than one with a short focal length. Wide-angle lenses can also be used for panoramic views of the sky. Since filters add an extra layer of glass for the stars' light to pass through, they should be selected carefully. UV filters, color filters and polarizing filters may be used but can also increase exposure time, leaving the image open to motion blur. This is an essential piece of equipment for long exposure photography. The tripod will be able to steady your camera while the shot is being taken, decreasing motion blur during long shutter actuations. Choose a tripod sturdy enough to balance both your camera and your lens, and make sire that it is on a level surface before attaching your camera. A cable shutter release or digital remote is optional, but very helpful when it comes to long exposure photography. The cable release attaches to the camera and allows you to activate the shutter without touching the camera. This decreases motion blur. A digital remote can be purchased for many modern digital cameras to perform the same function. More advanced models may include additional functions, such as the ability to change the shutter speed and aperture. Choose a high ISO or high speed film for your camera and make sure the setting is correct. A wide aperture will decrease the time the shutter will need to be open but also will decrease the depth of field of the image, so balance these two settings carefully. Begin with lower shutter speeds, such as 1/100th of a second, decreasing the speed as you test your exposure. Exposure for stars will be affected by moonlight, so remember to take this into account. For star trails and meteors, set the exposures to longer times, such as 30 minutes.